Last night, I re-watched most of High Fidelity for millionth time. It’s one of those movies that resonates with my inner record geek and reminds me what, but for the grace of my bride, I might easily have become. In this scene, Jack Black starts his shift at Championship Vinyl by subjecting the rest of the store to the almost oppressively upbeat ’80s hit “Walking on Sunshine” by Katrina & The Waves. It got me to thinking: could I build a bowl of sunshine? A few days ago, I visited the “we’re selling this produce cheap” bin at the market and picked up half a dozen yellow squash — a kilo and a half — for 99¢. Coulda wound up in lasagna. Coulda wound up in cornbread. But I’ve been on a bit of a soup kick lately. Yellow squash by themselves are not particularly assertive, taste-wise, so I knew they’d need a little help. A little spice. A little sweetness. And nothing that would detract from the yellow. The spice comes from white pepper and a jalapeño pepper (which is green, but tiny in volume compared to the rest of the soup). Coconut milk and corn provide the sweetness. 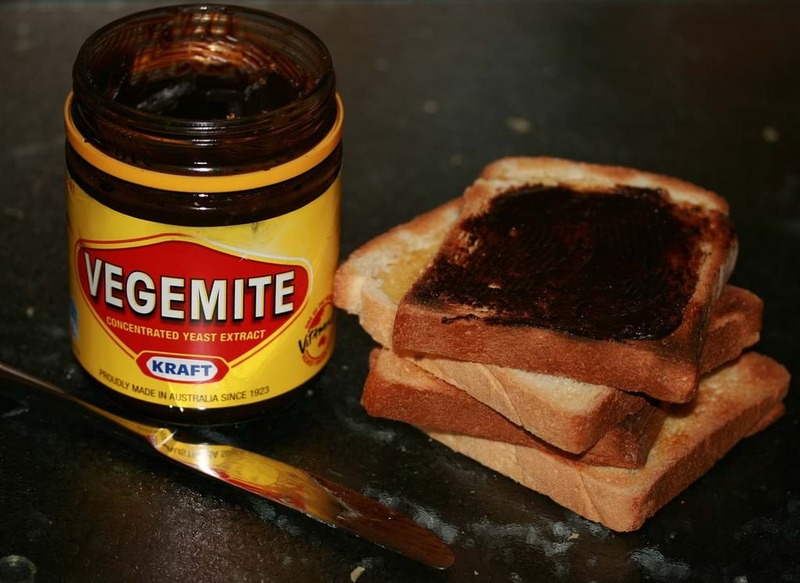 And because my vegetable stock base is the colour of Vegemite™, the main bulk of liquid in the soup is water. For a moment, I considered making it a curry-based soup (the Flavor the Moments blog has an excellent vegan take on that here), but ultimately this recipe from the Love & Olive Oil blog resonated with me most. Like many Instant Pot® recipes, this adapts easily to the stovetop; just add enough time to soften the squash. And boy freakin’ howdy, is this easy. The entire soup is made in the Instant Pot®, so no other pots and pans to clean up. 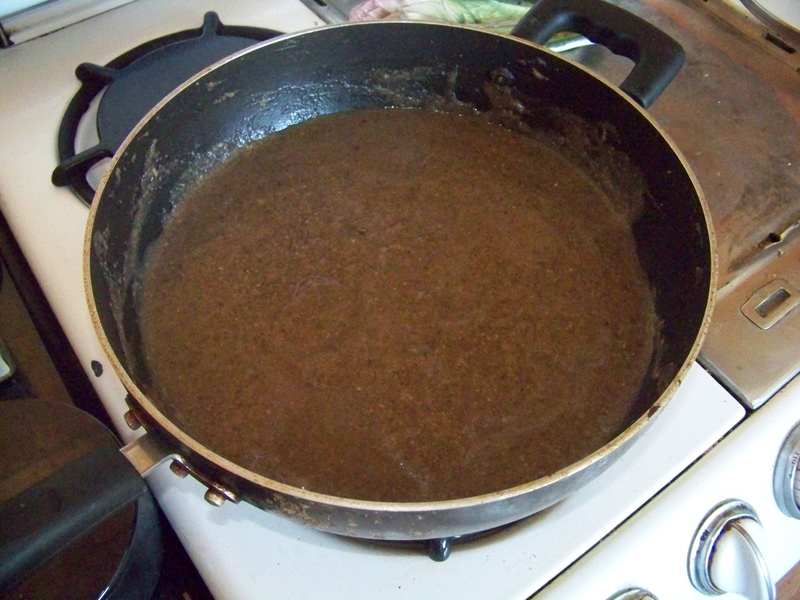 [It’s even done in a single pot on the stovetop.] Prep is not at all demanding, because everything’s getting blitzed at the end (even the cook, should you so choose). Chop onion and jalapeño and add them to the Instant Pot®’s inner cooking pot; set to “Sauté” function. Sweat the onions and pepper until somewhat softened, then add the chopped squash and continue to sauté for another three or four minutes, stirring occasionally to make sure nothing adheres to the pot. Add salt, water (or stock), coconut milk, thyme sprigs, corn, and white pepper; stir together. Hit the red “Keep Warm/Cancel” button on the control panel. Remove thyme sprigs, add lemon zest if desired, then process soup with immersion blender or in batches with a blender/food processor. [If you’re using either of the latter, drape a towel over the input tube or lid to allow the steam to vent.] Stir and allow soup to sit for a couple of minutes before tasting and adjusting spices. [NOTE: The immersion blender won’t make the soup silky smooth, so if that is your aim, use a Vita-Mixer and strain through a china cap. Ladle soup into bowls, drizzle in a teaspoon (5 ml) or so of olive oil if desired, then garnish with a few grains of black pepper and bit of chopped parsley, basil, chives, or green onion. It would seem that the most likely derivation of the word chowder comes from the French chaudière, meaning “boiler” (and is also an archaic French word for cauldron or kettle, from the Latin calderia). The Brits, though, not wanting to be left out of the linguistic fun, claim that the word springs from their jowter, or fishmonger. To be sure, many of the best known chowders do contain fish, but this one is a vegetable and fruit chowder that’ll stick to your ribs on a chilly night. The original recipe was published in the excellent Cook’s Illustrated All Time Best Soups volume, and this variation was also influenced by a post on the terrific Big Girls, Small Kitchen blog and Ina Garten’s recipe for Celery Root and Apple Purée (which is very much like this soup without the vegetable broth). I took two significant detours: I omitted the heavy cream (thus keeping the soup vegan), and substituted potato starch for wheat flour (which makes it gluten-free). Trust me, you won’t miss the cream a bit; if you process in a Vita-Mix, it will be plenty creamy, but even if you just use an immersion blender the soup will emerge a tiny bit more rustic, while still maintaining that silky mouthfeel. When it comes to the wine, you don’t really need to use a $38 bottle of Roche 2014 Carneros Chardonnay French Oak Reserve, but damn, it was good (and you only need half a cup (or 120ml). Special note for celiac patients: Be extra-sure that your vegetable broth is free of wheat or barley or malt products. These often show up in commercial vegetable broths and broth bases. Put butter, onion, fennel, and a couple of pinches of salt in a heavy-bottomed pot or Dutch oven, cook over medium heat until translucent, about 5-8 minutes. Add garlic and thyme, cook for 30 seconds to a minute until fragrant. Raise heat to high and add potato starch, stirring continuously, and cook for another 2 minutes or so. Add the wine to deglaze the pot, making sure to scrape up all the bits on the bottom; let most of the wine boil off. Stir in the vegetable broth, celeriac, potatoes, and apples. Add bay leaf and zest your citrus over the pot. Bring to a boil and then back the heat off to a high simmer. 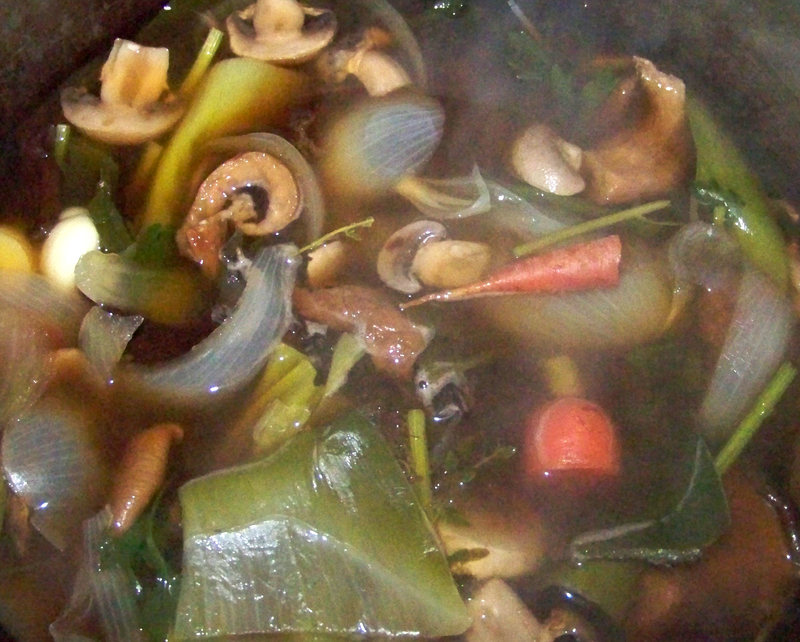 Cover pot and cook for 35-40 minutes, stirring occasionally, until vegetables are all tender. Remove from heat. Discard the bay leaf. Process 2/3 soup in batches; if you are using a blender or Vita-Mix, making sure to cover feed tube loosely with tea towel (do not plug it up, because steam needs to escape). Return processed soup to pot. [Alternatively, use an immersion blender to process soup, making sure to leave at least 1/3 chunky.] Season with salt and pepper to taste, and ladle into bowls. Garnish with fennel fronds and serve. Makes 6 servings. I’ve got a beef (no pun intended) with the Food Network and the Cooking Channel. Much like MTV, they drifted away from their original vision and began offering a schedule filled with fake drama and connerie that has precious little to do with anything that happens in a kitchen, professional or amateur. People being tasked to make dishes with ingredients like licorice, chicory, hickory, foie gras, and lima beans. The self-appointed Mayor of Flavourtown swanning around the country, sunglasses dangling ridiculously off the back of his bleach-tipped head like an errant swath of toilet paper attached to a shoe. And the content-free talking-head programs where workaday foodstuffs such as pretzels and cupcakes are routinely characterized by the multiple hosts as amazing. Look: if you can be amazed by a pretzel, your kidney is going to rocket out of your dorsal abdomen when you see the northern lights or the Eiffel Tower. Also, any native English speaker who modifies the word “unique” deserves to be banished to an asteroid outside the Van Allen Belt. So I’ve pretty much gone cold turkey (albeit heirloom breed, free-range, and antibiotic-free) on them. But when one network closes, another one opens. I discovered that one of my local PBS station’s digital sub-channels features programming from a sort of network-within-a-network: Create TV. It’s excellent, and filled with cooking friends both old and new. Julia Child. Andreas Viestad (of New Scandinavian Cooking). Rick Bayless. Steven Raichlen. Hubert Keller. And the timeless Jacques Pépin. 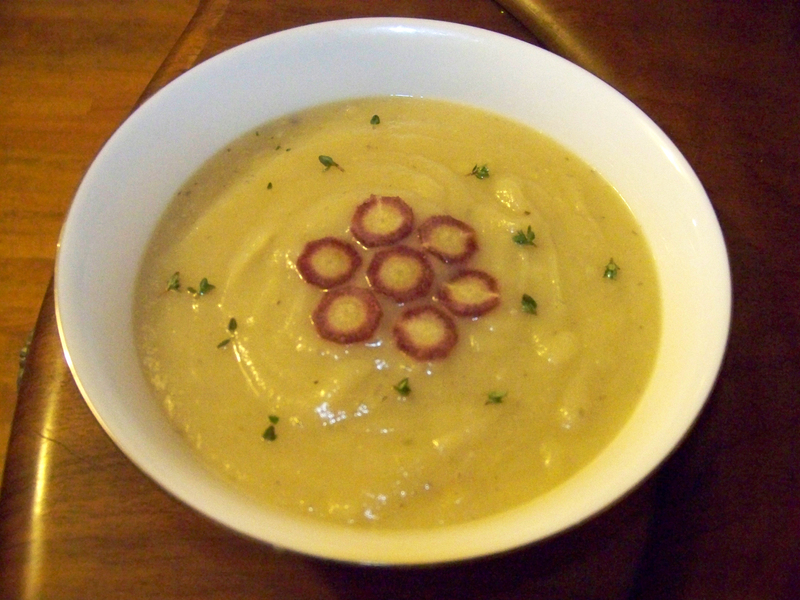 It was Pépin’s show that inspired me to make this soup; his version is potato-free and employs sour cream (I wanted to make mine vegan). I also wanted to tone down the heat a bit, and give it some more body. As it turned out, I had half a dozen Yukon Gold potatoes lying around, and they filled the bill nicely. But to add an extra bass note, I roasted them first. I should also offer up a hat-tip to the Kevin Is Cooking blog, whose Roasted Pasilla Chile and Potato Soup with Shredded Chicken recipe also inspired me. Before I get into the nuts and bolts, don’t blanch at the concept of the soup using a whole head of garlic. (Don’t skimp, either.) Because the garlic is added initially as whole cloves, it’s not overwhelming (even though it is puréed later). 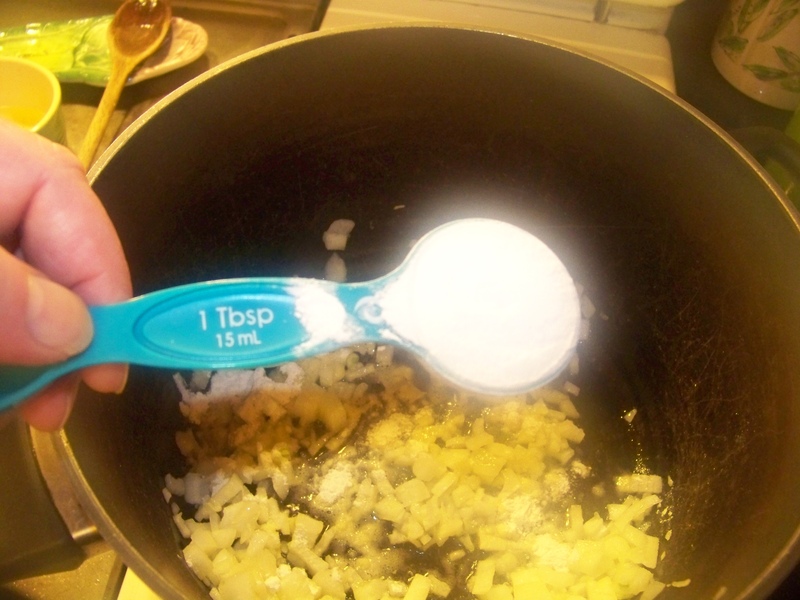 Which reminds me: if you are using pre-minced garlic or garlic paste, dial it back… A LOT. 1. Soak dried Pasilla chile peppers in vegetable broth for approximately two hours. When they are rehydrated, remove them from broth, seed them and chop them roughly. Set aside. Be sure to reserve soaking broth. 3. Peel garlic and dice onions. [No need to be too fancy here, since it’s all getting puréed later.] Place in large pot or Dutch oven with the remaining two tablespoons / 30ml of oil, and cook over medium heat until onions are translucent, approximately 5-7 minutes. 4. Strain in the reserved vegetable stock (this will catch any remaining seeds from the Pasilla soaking), and add chiles, potatoes, tomatoes, oregano, plus a little salt and pepper to taste (be frugal; you can always add some more later). 5. Bring soup to a boil, then reduce heat, cover partially, and cook at a simmer for 60 minutes (or longer, if you have the time). 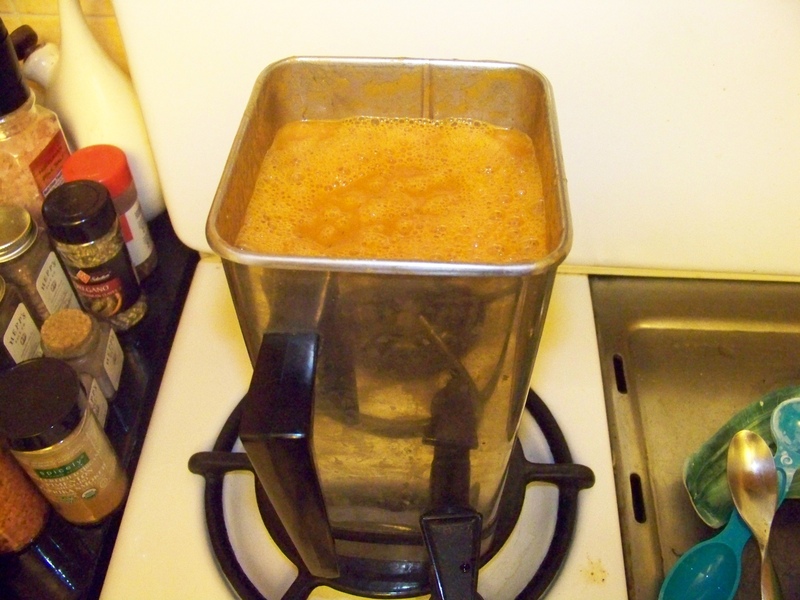 Process soup with immersion blender, food processor, or Vita-Mix. [Be very careful when you purée hot soup — leave room for steam to get out (I cover the feed tube loosely with a dish towel), and if using an immersion (stick) blender, be careful when it exits the surface of the soup, so as to avoid coating both chef and walls.] Adjust spices as necessary and serve. 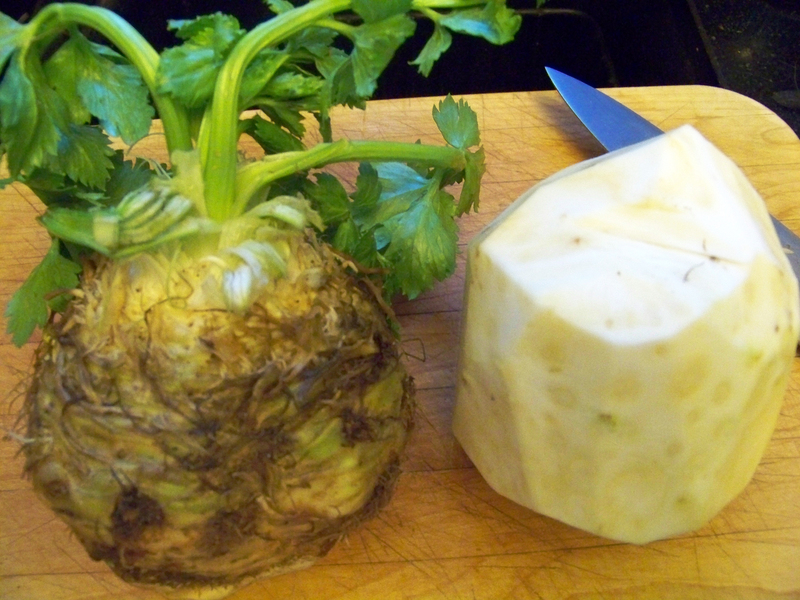 Celeriac, before and after a trim. If there is an uglier vegetable on the planet Earth than celeriac (Apium graveolens variety rapaceum), I have yet to find it. Fortunately, much as beauty is only skin deep, in the case of this magnificent and underappreciated vegetable, so is ugly. While celeriac itself doesn’t grow very deep — maybe six inches or so beneath the surface of your average garden plot — its roots in food history are deep indeed. In Book V of Homer’s Odyssey, it’s described as a component of Calypso’s garden, albeit in the Greek it is referred to as selinon. In one passage, Hermes admires the environs of Calypso’s cave, festooned with grapes, violets, and wild celery before stepping inside to beseech her to let Odysseus go and finish his journey back to Ithaca. But that’s another, much longer, story. In ancient times, and for much of their early history, both celery and celeriac were regarded more as medicines than as foodstuffs. 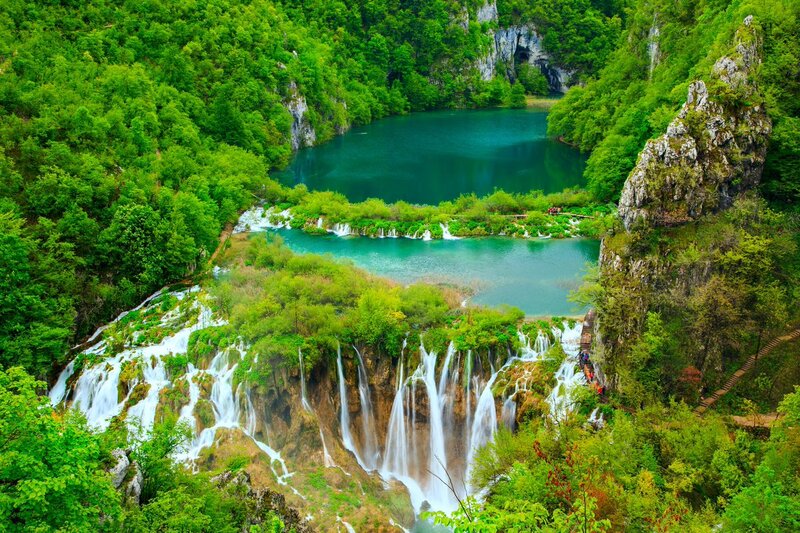 Pliny the Elder claimed that the so-called helioselinon was “possessed of peculiar virtues against the bites of spiders.” He also suggested that it could be used to revive sick fish. But by the 17th century, it was being cultivated in France, and by the 18th, it was being used in England for soups and broths. Fast forward to today: soups and broths! For your consideration, here’s a soup that contains not just one, but two of the planet’s least photogenic vegetables (the latter being parsnips), along with a little ginger (no beauty contest winner itself), some onion, tarragon, and lemon thyme. Before you get all huffy, this is not technically a velouté, inasmuch as it is not thickened with a roux and cream, but it resembles one in texture. If you just want to call it soup, you have my blessing. Cleaning the celeriac is best done with a very sharp knife, and it may be treated the same way you would strip off the rough outer skin of a pineapple; ideally, you’ll get off all the brown bits underneath the skin, but don’t make yourself crazy (or whittle the vegetable down to half its original size) getting there. Chopping the peeled celeriac is a bit of a chore, and may require rocking your knife back and forth a bit to get through the dense root. Alternatively, you can use a cleaver, if you have one. The parsnips should be scraped with a vegetable peeler, much like carrots, then chopped. As for the ginger, I started with a segment that was about the size of my thumb and scraped off the peel with a spoon before mincing it as finely as my admittedly mediocre knife skills would permit. Once the prep is completed, making the soup is a snap; basically, you just dump all the ingredients into a big pot, bring it to a boil, and back it off to a simmer for about an hour to soften up the veggies and give the flavours a chance to blend. Then remove the thyme sprigs (which will have shed their leaves), and transfer the soup, in batches, to a food processor, blender, or Vita-Mix. [IMPORTANT NOTE: Do NOT clamp down the lid on your food processor/blender in such a way that steam cannot easily escape, or you will run the risk of both scalding yourself and decorating your walls with hot soup. I leave the top plug out of my Vita-Mix’s “Action Dome” and drape a tea towel over the opening to allow steam, but not solids, to egress.] Alternatively, the soup can be processed in situ with an immersion blender. Process until smooth. Perhaps not the root of all soups, but it is a soup of all — well, almost all — roots. 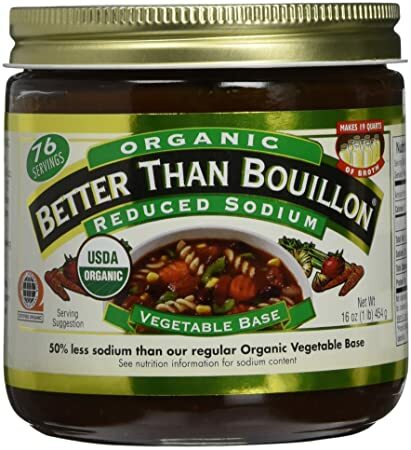 You might note that salt is not a component of the ingredients list, and that’s because the vegetable broth I used (I’m ashamed to admit that I didn’t have any vegetable stock of my own lying around) contained 570mg of sodium, presumably in the form of sodium chloride, which was plenty salty for my taste. Your taste (and your broth) may vary. To finish the soup off, I sliced a small carrot on a hand-held mandoline, arranged the carrot “coins” into a small “flower,” and sprinkled a few leftover thyme leaves on top. I might drizzle a few drops of olive oil on it as well next time, but it’s by no means necessary. Serves 6-8 (easily!) as an opening course. Despite the widely-held belief that “it never rains in southern California,” it does, albeit not often enough. Tonight, for instance, was a prime example of the occasionally intemperate nature of SoCal weather; a much-needed downpour, most of which would wind up in storm drains on a quick trip to the Pacific Ocean, rather than into the aquifers and reservoirs that could make the best use of it. Rain, for me, signals an opportunity to make soup, which matches inclement weather the way pearls go with Sophia Loren’s exquisite neck. In my youth, tomato soup meant a can of Campbell’s, made famous by Andy Warhol. 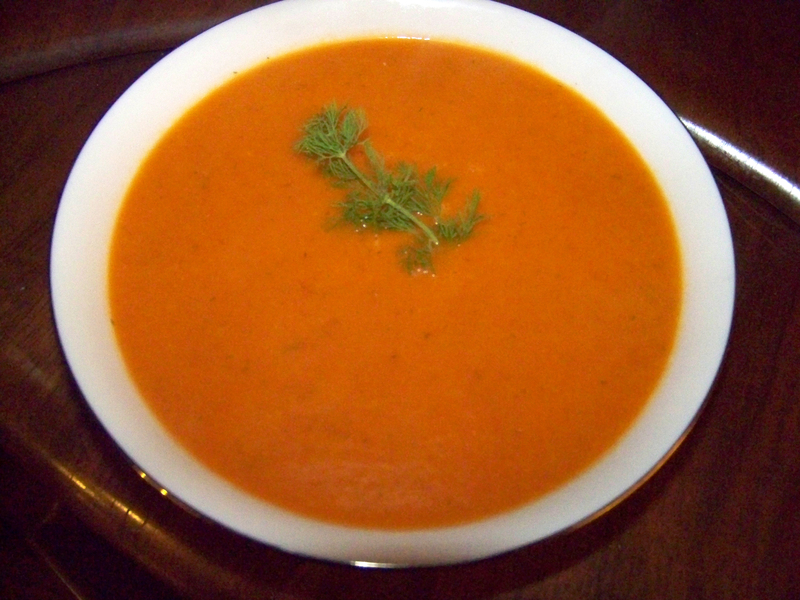 My late and much beloved mom used to prepare it in high style, diluting it with milk rather than water for an instant “cream of tomato” concoction, which remained the gold standard for tomato soup in my estimation until well into my adulthood. One weekend in my thirties, though, on a trip to Lake Tahoe, I tasted freshly prepared tomato soup for the first time, and it was nothing short of revelatory. I’ve been spoiled ever since. 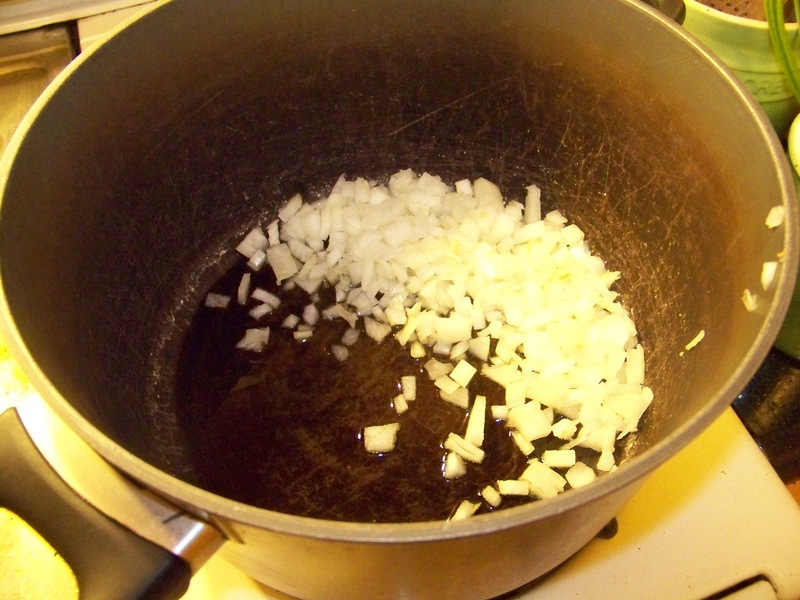 First, heat the olive oil in a soup pot, then add the diced onion at medium heat. Sweat the onion, allowing it to release its liquids, but don’t brown it. Add the Cup4Cup gluten-free flour, and stir, making sure to break up any lumps that might ensue (a whisk is good at doing this). Add the garlic and cook for about two minutes, stirring occasionally. 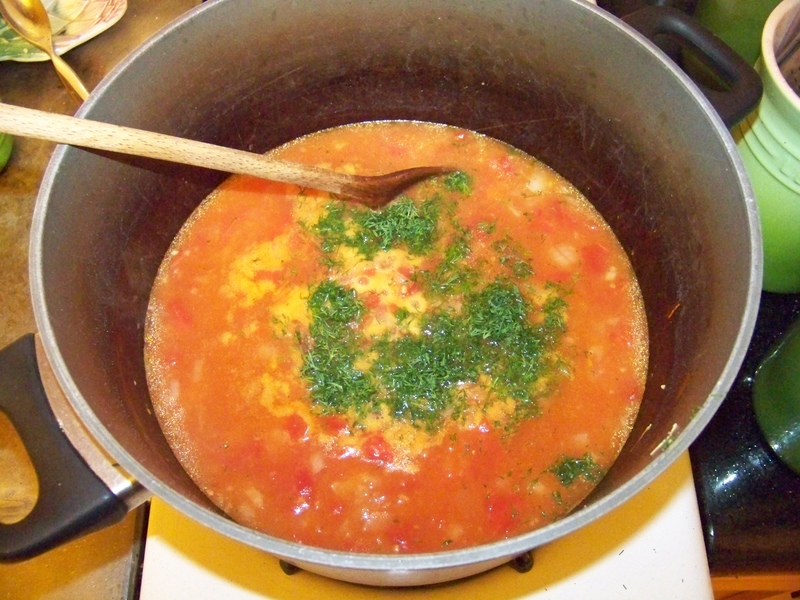 Then add the tomatoes, broth (a simple way to measure this is to fill up the empty tomato can), chopped fresh dill, bay leaf, salt, and pepper. Cook over medium low heat, stirring occasionally, for about 30 minutes, but you needn’t be particularly fussy about the timing; it’s just enough to let the flavours blend. From here, you have a couple of options. 1) Allow the soup to cool overnight in the refrigerator, and serve it the following day as a rustic cold soup, garnished with a dill sprig (and remember to remove the bay leaf!). A quick trip to the Vita-Mix. You can add a delightfully silky texture by stirring a dollop of cashew cream into each bowl (or cup). Garnish with a dill sprig, and serve. 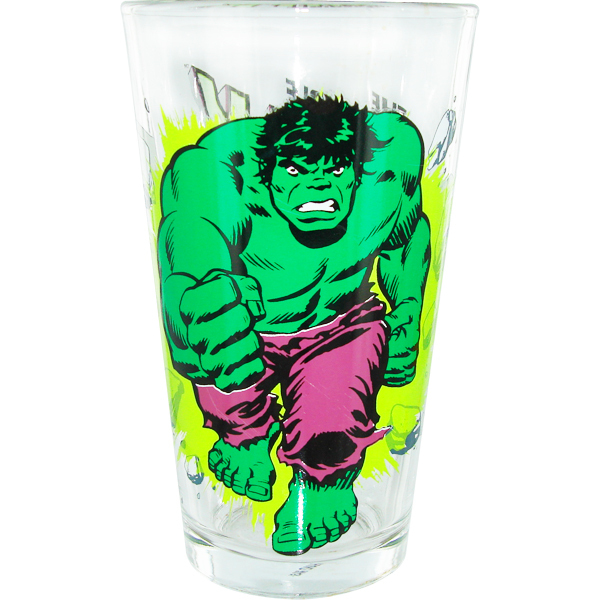 The Incredible Hulk consists of five simple ingredients: parsley, cactus, orange juice, pineapple juice, and celery. [Here’s a mnemonic for the ingredient list: CC POP.] Living as I do in the Los Angeles area, rounding up some cactus (known at the Mexican grocery store as nopales) was no big deal, and the rest of the items are available anywhere. I kinda cheated and bought pineapple juice and orange juice, rather than making them myself from fresh fruit, as I suspect the restaurant does. 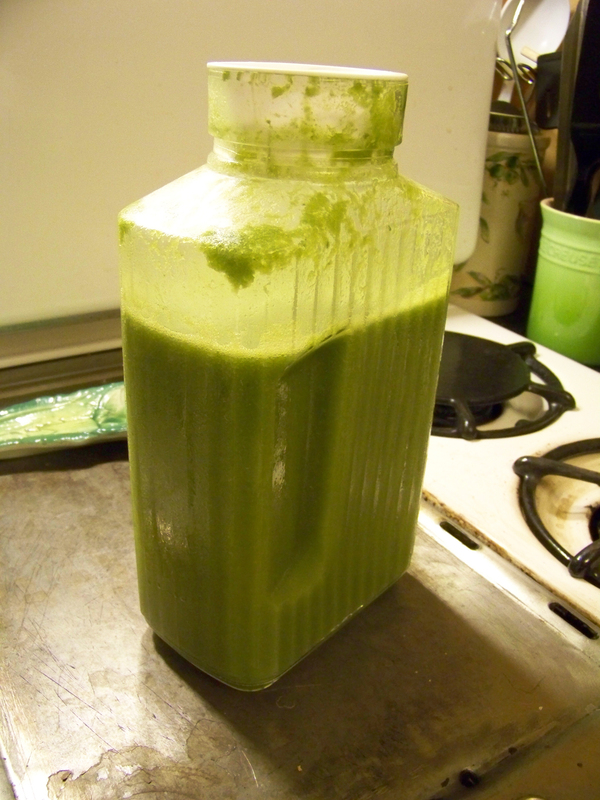 I revved up the old Vita-Mixer and ground up six large celery stalks, a pound of chopped nopales (do NOT buy the pickled version or the ones packed in brine for this! ), and a bunch of curly parsley with the bottom inch of the stems removed. I’ve discovered that adding a citrus juice (or any acidic juice) to cactus juice causes foam to rise more or less immediately, so don’t worry if that happens; you can skim it off or discard it. I just mixed it back in. 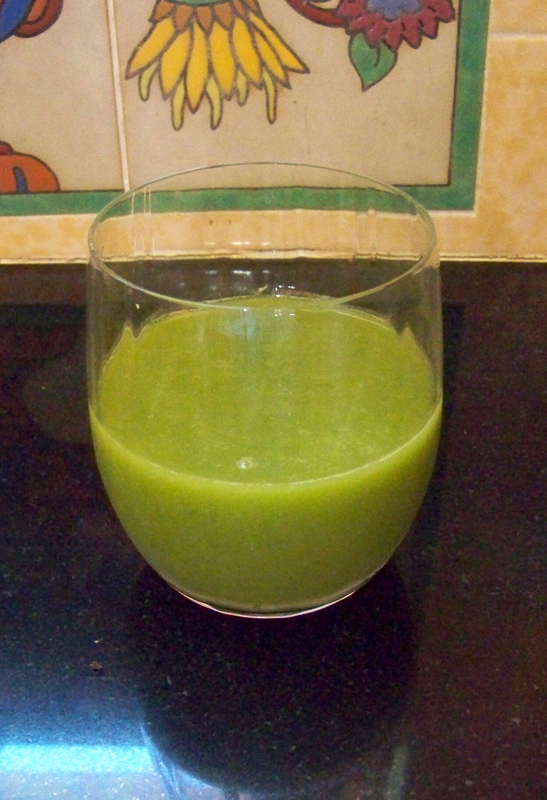 I prefer my juice a little “greener” than the one Paiche serves, so I used less of the orange-pineapple juice blend than they do, but you can experiment to find your sweet (or not-so-sweet) spot. First off, let me say from the outset that I’m not a “juice guy.” Sure, I’ve seen the infomercials and heard the testimonials and been subject to in-store demos, just like the rest of us. And I love juice; very few liquids on Earth bring me greater pleasure than a fresh-squeezed glass of blood orange juice. 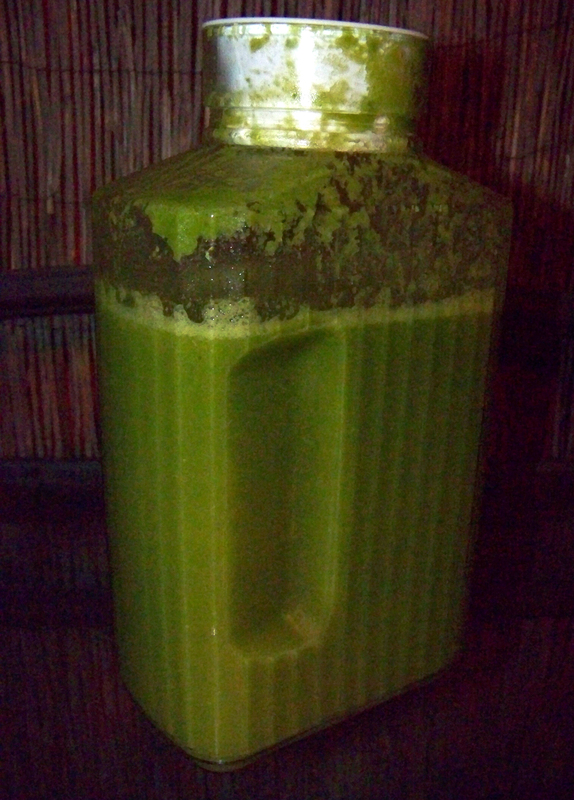 But I’m not persuaded that juice can rightly claim the curative powers that its disciples ascribe to it. 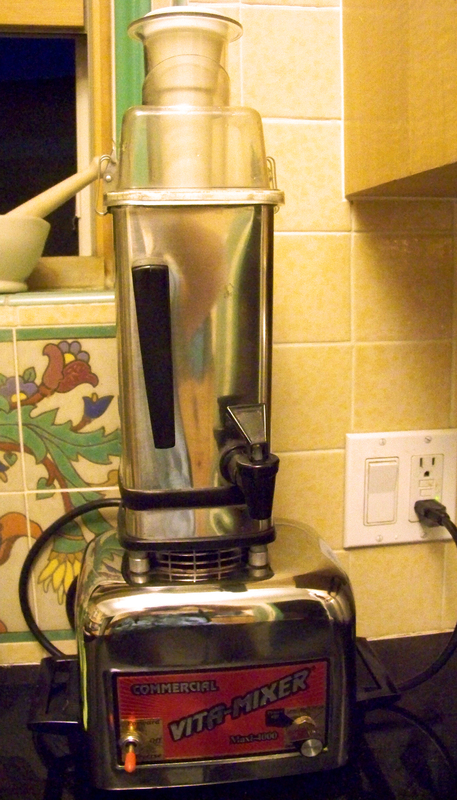 So it wasn’t for that reason that I found myself on Craigslist, obsessing over finding my first VitaMix (or Vita-Mixer, as it was known then). 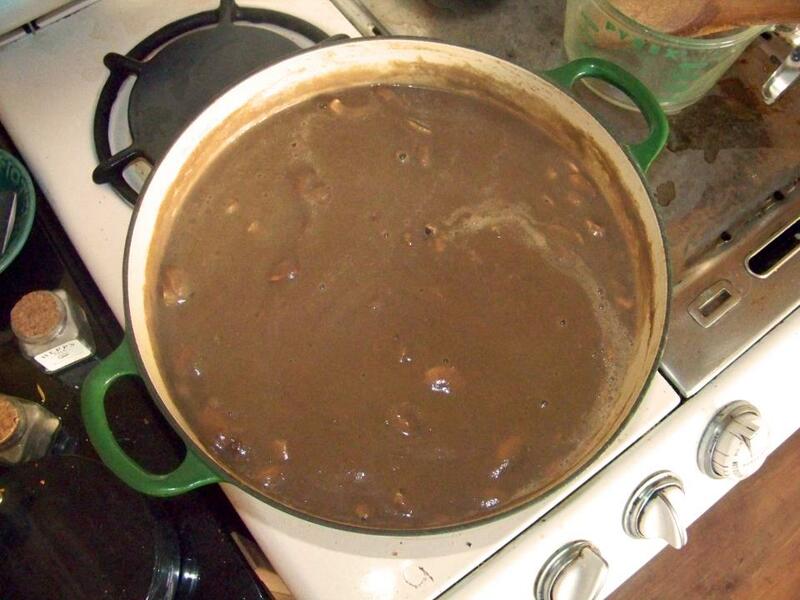 Last year, I had promised to make mushroom soup for a Thanksgiving gathering at our friends Rick and Lori’s house, and I knew that some of the attendees had dairy issues. Accordingly, I mused aloud on my FB page as to whether I should substitute almond milk, or cashew cream, or some sort of ersatz non-dairy sour cream substitute as a thickening agent, to give it a “creaminess” without using cream. My pal (and head chef at Papilles Bistro in Hollywood) Tim Carey commented, “I never use cream. Get yourself a VitaMix.” Okay. When you get advice from the guy who has made the best cauliflower soup you’ve ever had in your life, it makes sense to listen. VitaMix products are expensive. No, really. They are. Very. Expensive. Then again, so are Maybachs, and for much the same reason. I’m pretty sure I could throw a handful of gravel in my Vita-Mixer and come out with a lovely powder, suitable for sprinkling over a fruit cocktail that found itself light in mineral content. The one that I bought — a Vita-Mixer 4000, used, for $200 — had been in service for over a decade and a half, and the guy who sold it did so only because he had been given a new one as a present. It’s a champ, the very one pictured at the top of this post. Easy to clean, easy to use (though I have twice made a pretty comical mess of the kitchen by failing to secure the so-called “Action Dome”). The original cookbook, which came as part of the purchase, claims that one can actually use the device to cook soup, due to the friction of its rotors against the canister’s contents. That may be so, but the idea of having to listen to this device at full throttle for half an hour is about as appealing as being subjected to an extra-innings Justin Bieber concert. I made a mushroom stock from water and leeks and carrots and parsley and garlic and dried and fresh mushrooms (dried oyster and black trumpet mushrooms, fresh Eryngii, Maitake, and Bunapi mushrooms), then I sautéed a bunch of fresh mushrooms (I think there were seven different varieties of fresh mushrooms in the soup) and some spices, combined the whole lot (mushrooms, homemade mushroom stock, a bit of olive oil, a little fresh rosemary and oregano, and some salt and pepper) in the Vita-Mixer and puréed like a crazy man. The resulting soup — at least the part of it that I didn’t have to wipe off the cabinets, counters, and floor — was magnificent; creamy, hearty, aromatic. And I owe it all to the wonders of what might be the single most essential countertop kitchen device other than the toaster — the VitaMix[er].